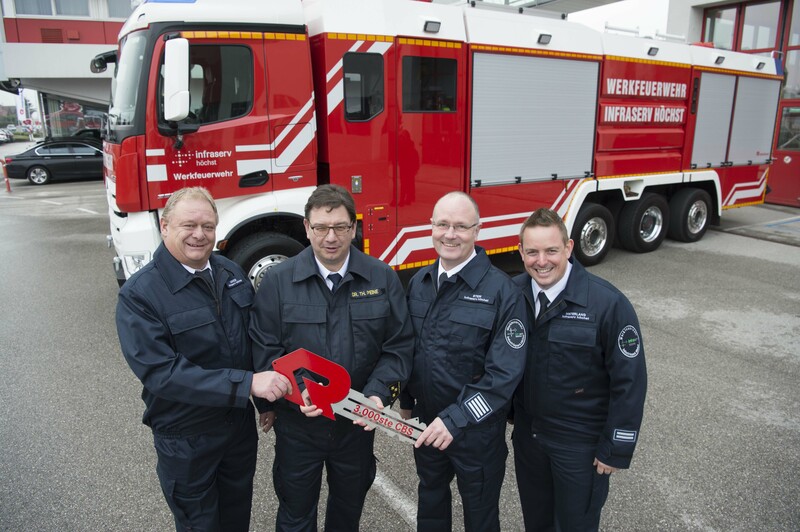 Leonding, Austria – Rosenbauer has been manufacturing Customized Body System (CBS) design fire trucks for the past fifteen years and mid-December saw the handover of the 3,000th vehicle to use this modular superstructure concept. 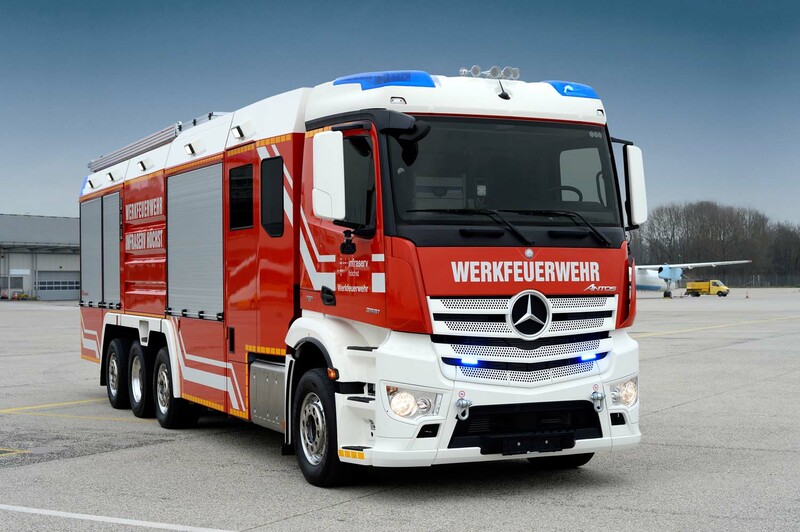 In future, this ULF model will be in operation at the Höchst Industrial Park in Germany with the Infraserv industrial fire service, which has an operational concept based on high-performance universal pumpers. With its limbered hose reel, the vehicle has a length of over twelve meters. It is one of the first trucks in Europe to be based on a Mercedes Benz Antos with a Tridem rear axle. The extinguishing technology is comprised by an N100 integrated pump in combination with two foam systems that can be employed separately. These consist of the HYDROMATIC industrial, pressurized proportioning system and the CONTI CAFS WR30 compressed air system with upstream DIGIMATIC42 proportioning. In addition, the truck has both powder and CO2 extinguishing units on board and thus the extinguishing agent payload is made up of 3,000 l of water, 2 x 2,000 l of foam in separate tanks, 750 kg of powder and 180 kg of CO2. Consequently, the fire service is well equipped for every type of industrial fire and ready for a quick attack. truck transports as much as 700 l/min, which means that the entire volume of water and foam delivered by the pump in hydrant operation can be turned into a water/foam mix. Both the N100 and the HYDROMATIC are powered by an auxiliary drive from the vehicle’s engine and are harmonized to perfection. The foaming agent pump drive is regulated in such a way that the pressure on the foam side is always 0.5 bar higher than that on the water side. The great strength of the HYDROMATIC is its flexibility. A choice between water and a water/foam mix is available at every outlet and the proportioning rates can also be set individually. All the outlets are fitted with automatic Venturi proportioners, which allows smooth regulation between one and seven percent even during operation. The pressure outlets are adjusted manually via a foam agent valve mounted above the outlet, while the roof monitor proportioners are controlled from the rear of the vehicle in the area of the central pump armature panel. In addition to the HYDROMATIC, a CAFS system with electric wet/dry adjustment is installed in the vehicle. This consists of an electrically powered and electronically controlled DIGIMATIC42 pressurized proportioning system in combination with a CONTI CAFS WR 30 compressed air foam unit. Foam proportioning takes place through injection into the pump’s own B-outlet via the DIGIMATIC. The compressed air foam is then created in a downstream, CAFS mixing chamber through the addition of compressed air. CAFS foam is characterized by its homogeneous structure, outstanding adherence on smooth and vertical surfaces and high, energy content, which facilitates excellent throw distances. The CAFS outlet can be operated solely with water, or a water-foam mix via the DIGIMATIC, the proportioning rates of which can be smoothly adjusted between 0.1% and 6%. Owing to this spread, the DIGIMATIC can be employed for the production of foam that is formed in the branch/foam pipe, or used solely with mains water. All in all, the vehicle is equipped with twenty pressure outlets, sixteen of which are supplied via the HYDROMATIC, one by the DIGIMATIC/CONTI CAFS and three directly from the pump, which always remain foam-free. Furthermore, the truck has a quick attack unit for powder and CO2. The powder and CO2 units are installed in the two front equipment compartments. Using the CBS modular system, the vehicle was built from laser-cut, beveled and bonded or bolted aluminum sheets. The system permits the realization of individually designed fire trucks of any size and with any equipment, ranging from special municipal vehicles to universal industrial pumpers. The complete superstructure consisting of a tank, equipment compartment and pump room modules is mounted on a central auxiliary frame. The walk-in crew cabin is linked to the original driver’s cab via a bellows connection. The entrances are fitted with fold-down steps and there are four seats with PA fixtures in the crew cabin. An extendable FLEXILIGHT lighting mast is mounted on the superstructure roof, there is a rear-mounted traffic direction unit and all the lighting units employ LEDs. 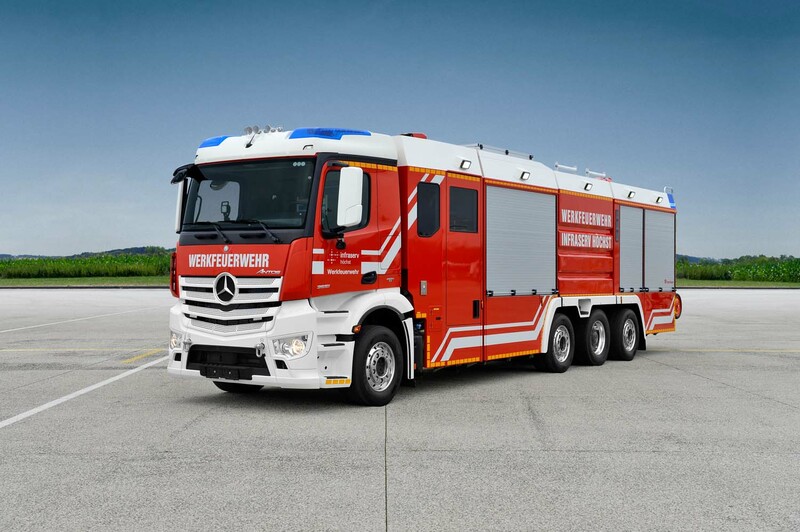 The Infraserv Höchst fire service is one of the German chemicals industry’s largest and best-known works units. 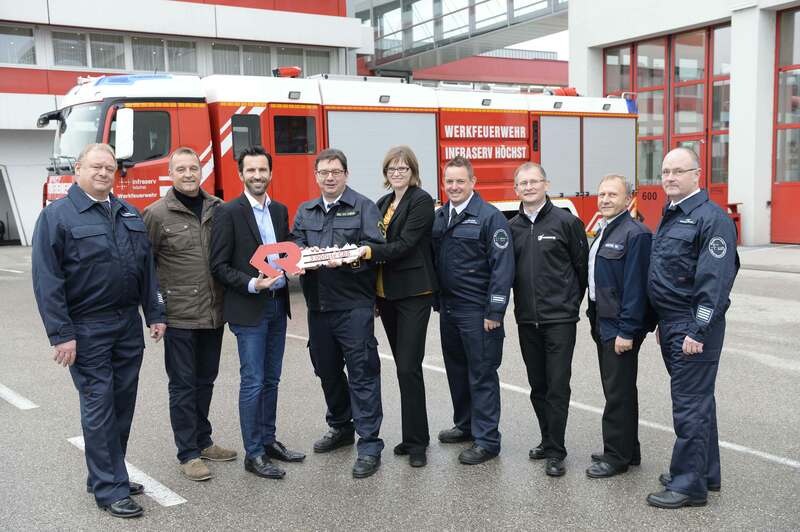 It operates two fire watches on the 4.6 km2 compound of the Höchst Industrial Park with the result that following an alarm any part of the site can be reached within five minutes. The vehicle fleet is comprised of four vehicles with virtually identical extinguishing payloads, seven rescues, two aerials and numerous roll-off containers with a swap body vehicle. At least 24 of the 115 professional firefighters are on call 24-7 and the service completes roughly 1,000 operations yearly. 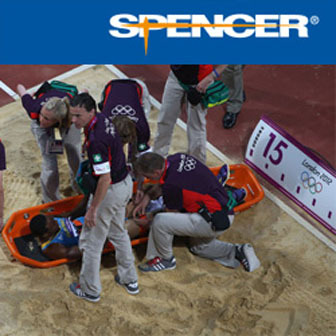 Apart from fire protection, its assignments include human rescue and technical support, which extends to a transport and accident, information and assistance system (TUIS), fire protection planning and the maintenance and inspection of the Industrial Park’s stationary fire protection devices. The fire service also has the task of drawing up the escape route, rescue and fire service plans.